This blade belongs to Saijyo saku ranking. Blade length : 55.14 cm or 21.70 inches. Sori : 0.76 cm or 0.299 inches. Width at the hamachi : 2.94 cm or 1.15 inches. Width at the Kissaki : 2.37 cm or 0.93 inches. Kasane : 0.66 cm or 0.25 inches. Shape : Regular width and thickness with small Sori. Osuriage Mumei Wakizashi. There are double-Hi on both side of the blade. Jitetsu :Itame hada well grained with much Jinie attach and Chikei appear and strong Jigane. Hamon : Nie deki, Gunime midare hamon and Notare midare hamon mix. In Ha, there are many Sunagashi and Kinsuji work. 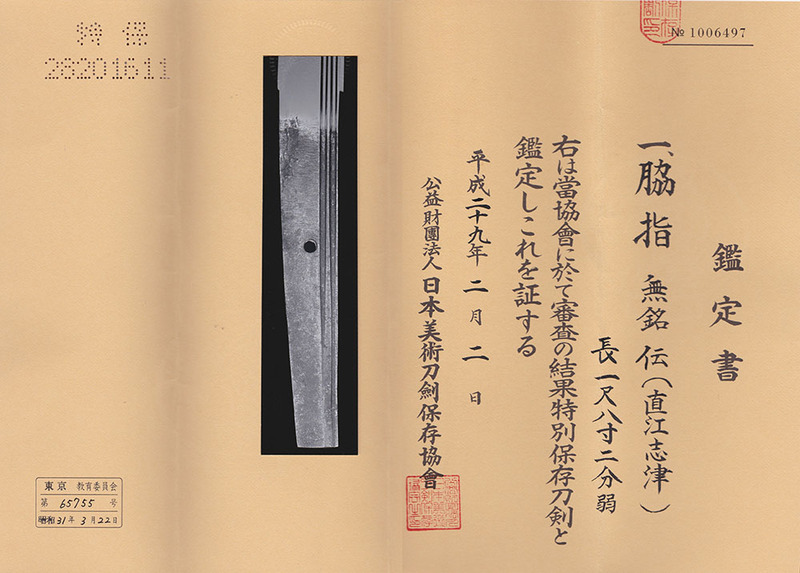 Special feature : The NBTHK judged this unsigned Wakizashi as Den Naoe-Shizu. The name of Naoe-shizu is the general term of the pupils of Shizu Saburo Kaneuji. Shizu the First, Kaneuji was one of the most skillful swordsmiths of the Masamune School. in Mino province and forged sword there so they are called Naoe-Shizu. Kanetomo, Kanetsugu, Kanenobu and so on are seemed to correspond to Naoe-Shizu. The style of Naoe-Shizu is that: a compact Nioi-Kuchi and dull activity in the ha compared with Shizu style. The blade is elegant and fantastic Jigane and Hamon. The blade is very precious. Tsuba : Round shape Shakudo Nanako Tsuba, Shishi dogs are engraved with gold color. Fuchi: Shakudo, family crests are engraved. Saya : Black Roiro Saya with Kizami pattern. Menuki : Shakudo, person is engraved with gold color. From Aoi Art: This blade has beautiful Jitetsu and good work in Ha. We recommend this blade very much.